From the point of view of follicle cells, the formation of the egg chamber involves three interdependent processes: (1) proliferation of follicle cell-specific stem cells, (2) migration and encapsulation of the 16-cell cyst initially by approx 30 follicle cells, and (3) differentiation of follicular epithelium and follicular stalk to separate the egg chambers (21). 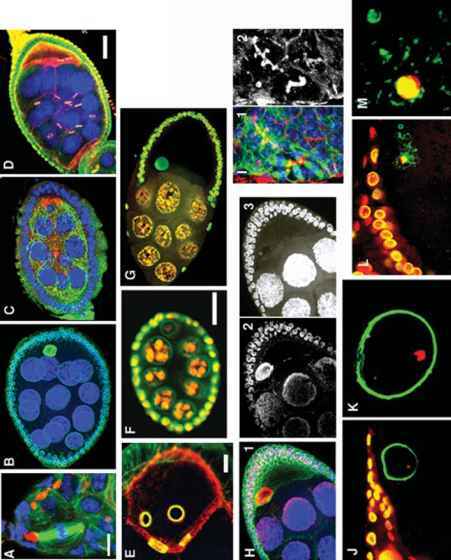 Some defects in these processes lead to egg chambers with 2 or more 16-cell cysts. The stem cells of follicle cells are located in the germarium at the transition of regions 2a and 2b. Follicle cell stem cells divide continuously (52) and are regulated by the terminal filaments (53). Proliferating follicle cells migrate between successive 16-cell cysts, first contacting the posterior portion and eventually surrounding the entire lens-shaped 16-cell cyst (54). Follicle cells that contact the germ-line cells fully polarize and form a follicular epithelium, whereas a second group of follicle cells forms the interfollicular stalk. Apical, lateral, and basal polarization cues contribute to the development of the follicular epithelium, and proteins like Crumb and Discs Lost play a determinative role in these processes (55). DE-cadherin levels are elevated both in the oocyte and in follicle cells at the anterior and posterior poles and contribute to the posterior positioning of the oocyte in the forming egg chamber (54-56). The position of the oocyte determines the anterior-posterior polarity of the egg chamber. The follicular stalk attaches adjacent egg chambers to one another as they leave the germarium. Two pairs of polar follicle cells situated at the anterior and the posterior poles of an egg chamber make contact with the follicular stalks. The polar cells are determined in the germarium, where they cease to divide and accumulate DE-Cadherin. They are the keystones for follicle cell patterning, for they nucleate subsequent patterning of the terminal follicle cells (54-57). During stages 2-6, terminal follicle cells are established at the anterior and posterior ends of the egg chamber. Whether anterior or posterior, all terminal follicle cells have the same positional identity and are competent to give rise to anterior cell identity. Main-body follicle cells continue to divide during stages 2-5, whereas in stage 6, endoreduplication and chorion gene amplification are initiated (see Chapter 8). At stage 7, a Gurken signaling event (initiated in the oocyte) specifies posterior follicle cell fate, thus polarizing the anterior-posterior axis of the follicle epithelium (58,59). During stage 9, the patterning of follicle cells continues and they reorganize into three domains: a small cluster of border cells inside the egg chamber (between the nurse cells and oocyte), a squamous epithelium over the nurse cells, and a columnar main-body epithelium over the oocyte. The border cells detach from the anterior epithelium and migrate through the nurse cells to reach the oocyte. At the same time, the cuboidal main-body follicle cells move posteriorly to form a columnar epithelium over the oocyte. The remaining 30-40 anterior terminal cells flatten over the nurse cells and form a squamous epithelium. During stages 7 and 8, the oocyte nucleus is repo-sitioned in the antero-dorsal corner, and a second Gurken signaling is initiated, an event crucial for the dorsal-ventral patterning of the follicle cells (60,61). As a consequence, the fate of the dorsal follicle cells is specified, the ventralizing signal is restricted to the ventral follicle cells, and border cell migration is initiated. The main-body follicle cells, executing their posterior migration, are exposed to this Gurken signal as they pass near the oocyte nucleus and, consequently, they adopt a dorsal fate. The formation of dorsal appendages and operculum depends on the dorsal and anterior patterning of the anterior columnar follicle cells (62). At stage 10b, the follicle cells migrate centripetally between the nurse cells and the oocyte, enclosing the anterior of the egg. The migrating follicle cells arise at the border between the anterior squamous and the main-body columnar follicle cells, which overlay the border between the nurse cells and oocyte. Their migration occurs concurrently with nurse cell dumping, so that follicle cells cap the oocyte after the nurse cells have expelled their contents. The cells at the leading edge of centripetal migration come to rest at the border cells, and through their coordinated action they create the micropyle (63). The immunostaining methods in Subheadings 3.1.-3.4. can be used to visualize some of these follicle cell-related processes by using antibodies against lamin, a- or P-tubulins, actin, P-spectrin, DE-cadherin, nonmuscle myosin II heavy chain (MHC), Crumbs, and Discs Lost (see Appendix B).